Today was an amazing day for me. Today I changed myself in a way that I never thought that was something that could be changed by simply committing to the idea of changing it. Today I radically changed something in my brain by simply telling myself I could do it. Next stop? 1000 Feet Down. 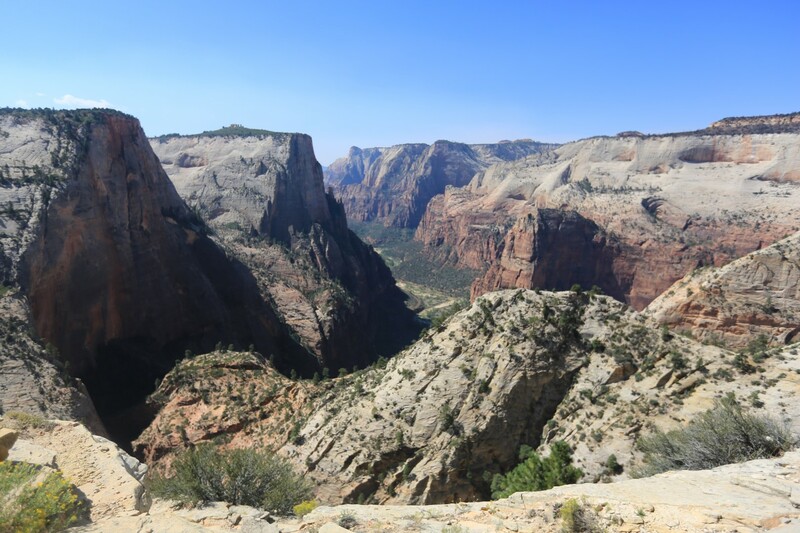 So today I visited Zion National Park in Utah. Zion is a place of elevation. Literally. Zion has hikes that have signs which read something to the effect of “Be careful, people have fallen to their death on this hike.” When you take the tram into the canyon which courses through the canyon of Zion national park at each stop where there is one of these hikes the recorded message states the same thing “Be careful, people have died falling”. At the top of observation point. With that said, the hiking trails are truly pretty hard to concieve of how a person would achieve this death. The trails are as wide as a sidewalk. 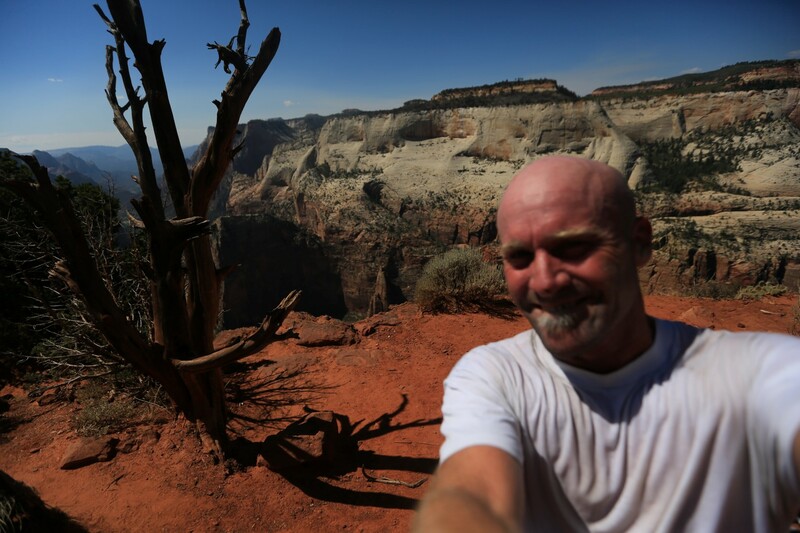 Yes, there is no guardrail and yes ….. the drop from the edge is at times about 1000 feet ….. 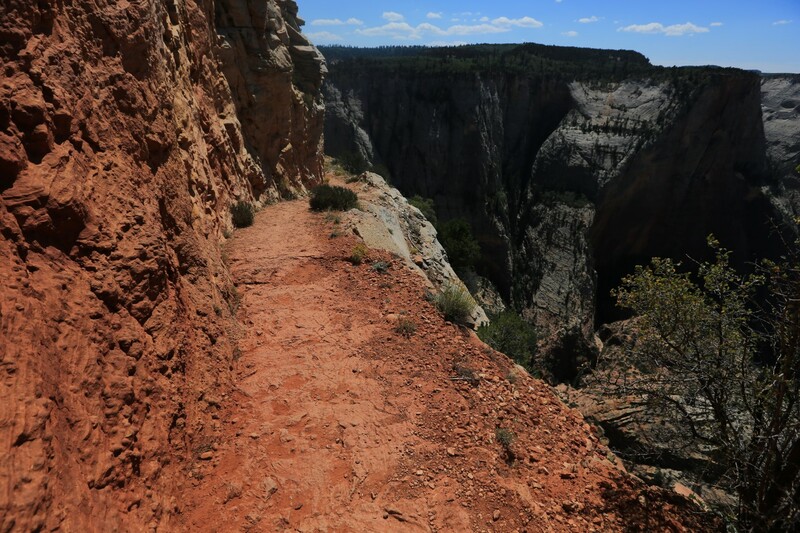 BUT – the reality is that if you stay on the wall side of trail you would really need to have a spectacularly non-regular fall in order to actually launch off the side to your death. Now, None of this is really important if you have a fear of heights. For me I am not technically afriad of heights. Historically I have actually been perfectly fine with a massive height as long as there is a decent sized man made boundary between myself and tripping and falling. I had no problem standing on a glass deck with a head high metal railing over the canyon in Mexico and viewing areas of large tower buildings aren’t a problem for me. So, historically I have been afraid of heights when there isn’t a guard rail. I think that my brain thinks I am too clumsy and somehow I would achieve a 10 foot wide lateral roll if I stumbled. 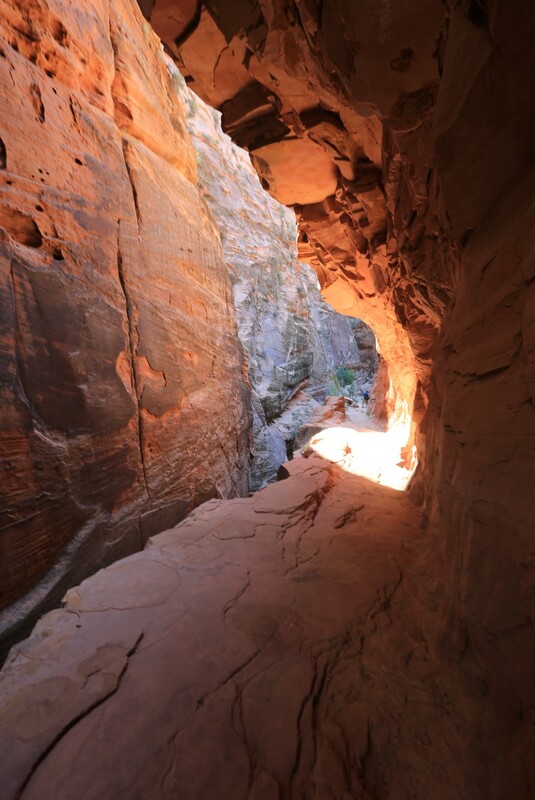 I rememeber once in Arizona I was afraid to cross a rock arch which was literally 20 feet wide. 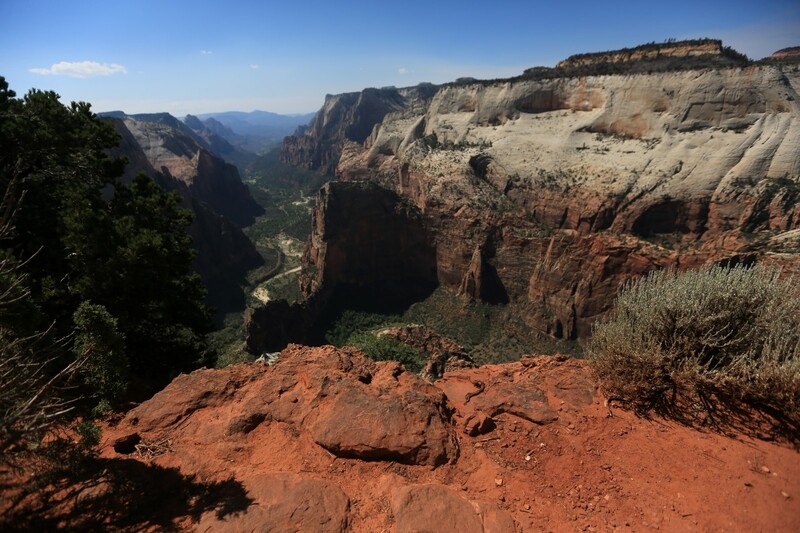 And, Katie and I came to Zion on our very first trip that we took together. We had a great time but when we came to the climb which I completed today I literally stopped in the middle, sat against the wall and told her that I was too scared to continue. I couldn’t even stand up for maybe 10 minutes. She sat, waited and then we turned around. Today I entered the park and told myself that I could be better than that and that my fear was not rational. Well, I did it. I wasn’t even nervous at any point. It’s an interesting story for me. I don’t believe that a person can change themself in any way that they choose. For example I don’t in any way think that with all of the training in the world that I could become a professional surfer, snowboarder or any other type of athelete – even if I had started that sport when I was an infant I am one to thing that the majority of what makes those goals is genetic. With that said, however, I now am a stronger proponent of the idea that you CAN do things that maybe you thought you couldn’t do – especially if the driver for thinking that you couldn’t do them is a construct inside of your brain more than anything else. Who knows – all I know 100% now on this topic is that I am now able to walk along a “sidewalk” without a guardrail which happens to have a 1000 foot straight down dropoff on the side. That’s pretty cool in my book. 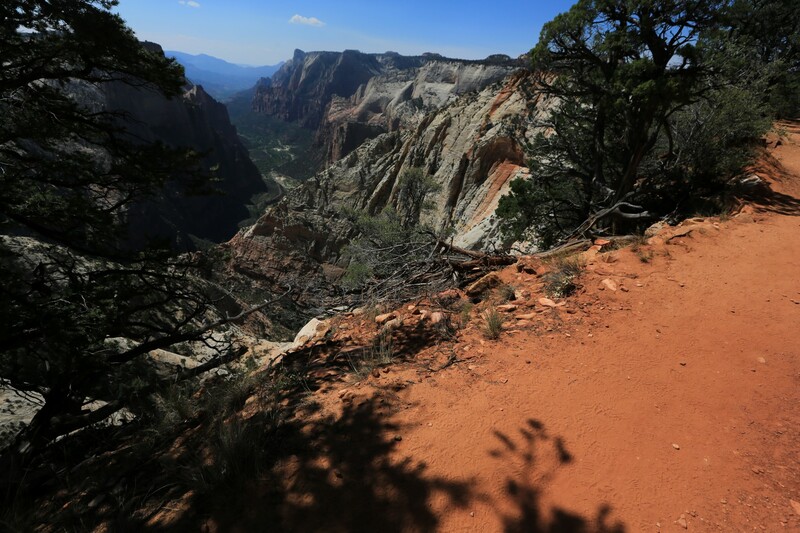 And oh, yes, on the Curious Adventure – Zion National Park is a strong recommendation as noted before for anyone who ever visits Las Vegas. Gallery below the blurry token selfie. ← Time for a Safari! …. In … Wyoming.